After 145 years, the Ringling Bros. and Barnum & Bailey Circus is ending its elephant acts by 2018, among the concerns over animal treatment. The circus currently has 13 elephants traveling with its tour units. They will be relocated to the Ringling Bros. Center for Elephant Conservation in Polk City, Florida once their acts end. More than 40 other elephants are already at the Center. However, other exotic animals such as lions and tigers will continue performing. It's a victory for the animal rights groups such as PETA and the American Society for the Prevention of Cruelty to Animals who have been claiming mistreatment of circus animals for a long time. While the parent company of the Ringling Bros. and Barnum & Bailey Circus was able to won a nearly $16 million settlement from a number of animal-rights groups including the Humane Society of the United States, ending a 14-year legal battle, it was the shifting consumer perceptions done the elephant acts in. 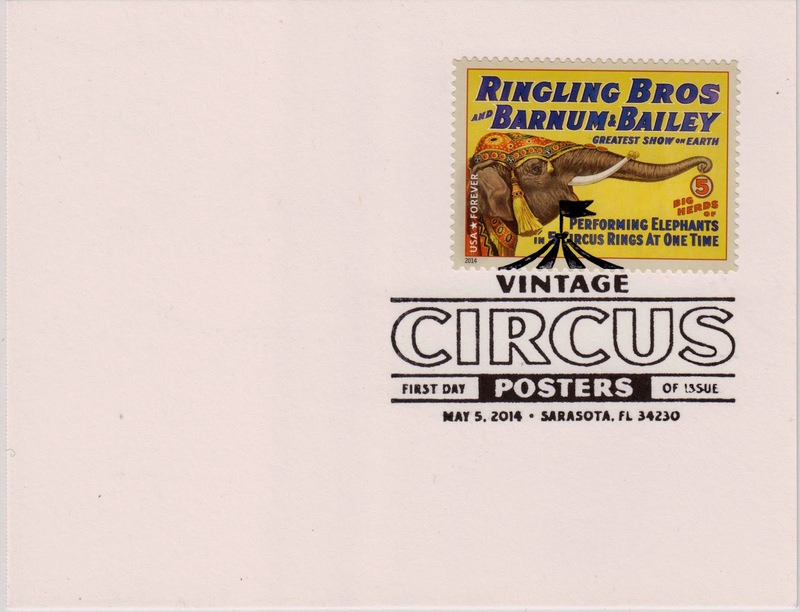 The stamped card features one of the eight USPS Vintage Circus Posters Commemorative stamps which uses a reproduction of a 1926 Ringling Bros. and Barnum & Bailey poster made by the Strobridge Lithographing Company, showing an ornately costumed elephant. The vintage poster used a bragging tag line “5 Big Herds of Performing Elephants in 5 Circus Rings at One Time” to advertise the Greatest Show on Earth. The card has a pictorial first-day-of-issue postmark on May 5, 2014 from Sarasota, FL 34230.